The key to a better body is a healthy brain. Based on the latest medical research, as well as on Dr. Amen’s two decades of clinical practice at the renowned Amen Clinics, Change Your Brain, Change Your Body shows you how to take the very best care of your brain. When your brain isn’t functioning properly, that dysfunction manifests itself in your physical body. Because you can’t see your brain, however, you don’t do anything to fix the problem at its source, leading you to adopt quick fixes and temporary solutions that ultimately fail. 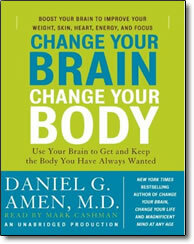 In Change Your Brain Change Your Body, however, Dr. Amen takes you inside the brain to show you the ways in which you can harness its power to create the body you have always wanted. Whether you want to tighten your tummy, have younger-looking skin, boost your energy level, stop getting so many colds, or lower your blood pressure without having to take medicine. This breakthrough approach will allow you to harness your brain’s power to improve your body’s overall appearance and function. As Dr. Amen’s studies show, a healthy brain is the key to a better body and a better life. Your brain is the command and control center for your body, and your brain function is directly related to how your body looks, feels, and functions. If you want to lose the love handles, you have to get better frontal lobes. You want to say goodbye to all those headaches? You have to calm your brain. Turn back the clock and get rid of those wrinkles? You have to start by rejuvenating your brain. One size does not fit all, however, and Change Your Brain Change Your Body helps each individual reader navigate their brain to identify areas in need of improvement. Dr. Amen provides a customized, tailored approach to making positive changes, through treatments such as vitamin therapy, relaxation exercises, and physical activities, that will improve the way you look and feel. The brain controls everything you do: how you think, how you feel, how you act, and how you look. In order to get the body you have always wanted, your brain must work right and Dr. Amen shows you how to improve your brain’s health so you can have a better body. I truly feel that you are right on time with this. The world is in need of body balance, healing and weight loss. I would love to attend a live session, but I’ll get the DVD which is just as good as being there.